And Dare to Get Dirty week continues! You can view a Master List of all the Challenges Here, but you’ll need to be a Fan Club Member. This first card was made for the following DTGD challenges: DTGD10JeanneS, DTGD10DeborahLynneS, DTGD10cindy_haffner, DTGD10flowergal36 and DTGD10justwritedesigns01. That’s a lot of challenges! I worked on this off an on over a couple of days and putting all the pieces together was really a challenge in itself. All images are Sparkle N Sprinkle. Actually there are only 2 stamped images; the lawn chair and the sentiment. Everything else was done with punches and scissors. The flower/sun and umbrella were both created using Quickutz scalloped flower dies and a chrysanthemum punch. The two bands of grass were cut with pinking shears then slits cut all along the tops. Greenery and flowers were also added. The sentiment was stamped on a leftover brayered piece and hand trimmed. A little butterfly was punched and a trail drawn with a black pen. Finished card measures 4.5 x 6.25 (A6). This second card was done for the sketch challenge, SC290. Since Roxie based the sketch on this card I did last year, I couldn’t pass up making a card for the challenge. I was pretty excited when I saw the challenge. 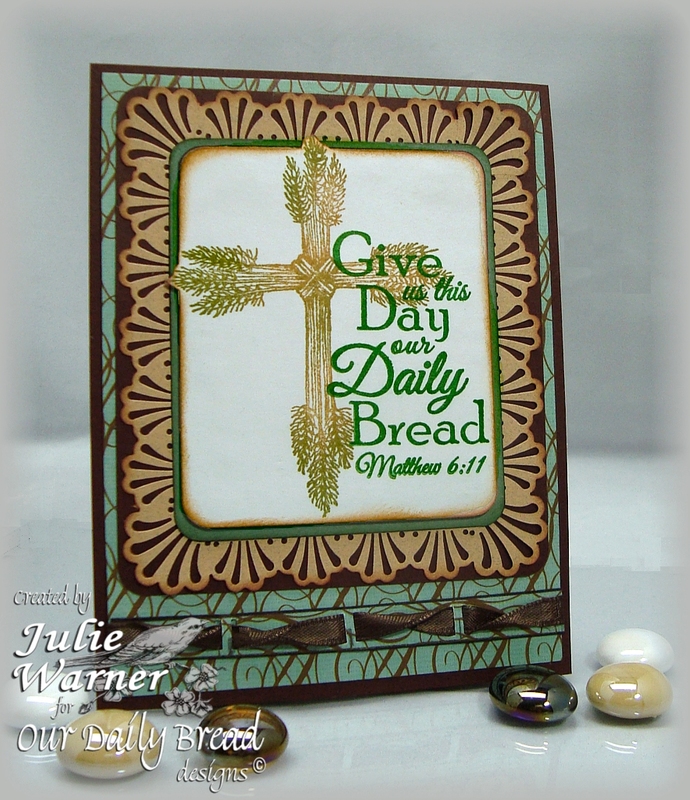 All images are Our Daily Bread designs. I started with what I thought was a quick and easy idea: split the image over the three panels. Even with the SAMJ (stamp a ma jig), it’s harder than it sounds. But I finally got it to work. The left and right squares were punched in opposite corners and each square was matted with black, then attached them to a larger ivory panel. 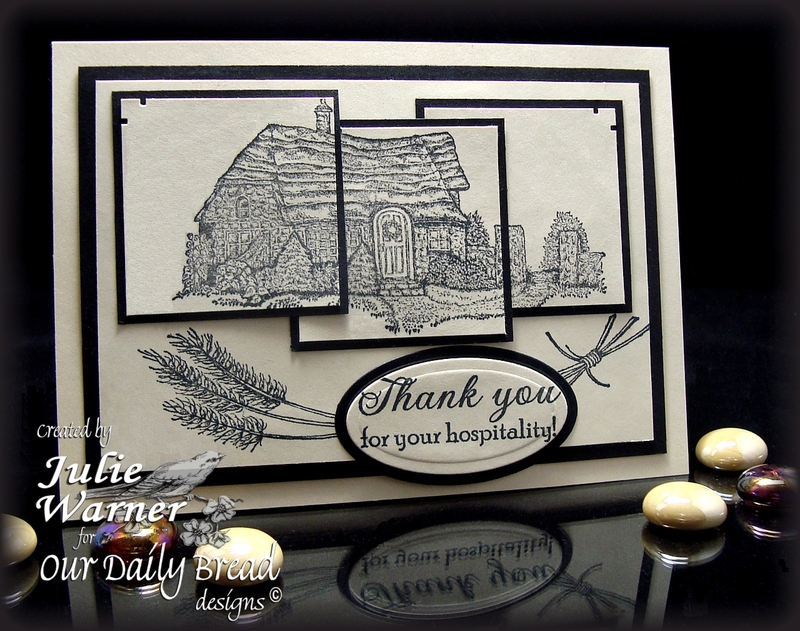 I stamped the wheat image below them and added a larger black mat. The sentiment oval and black oval were cut with Spellbinders petite ovals. The finished ivory card measures 6.25 x 4.50 (A6). Dare to Get Dirty Week Continues!! Judging from Fan Club response so far, Dare to Get Dirty 2010 is a hit! And it’s a lot of fun. Not only do the FC Members get a chance to play in the dirt with the past and present Dirty Girls, they get to ask us questions or chat with us in the DTGD Forum. We still have more challenges – all the way thru Friday! This first card is for my challenge DTGD10justwritedesigns02. All images are DRS Designs. I just love these ladybugs! 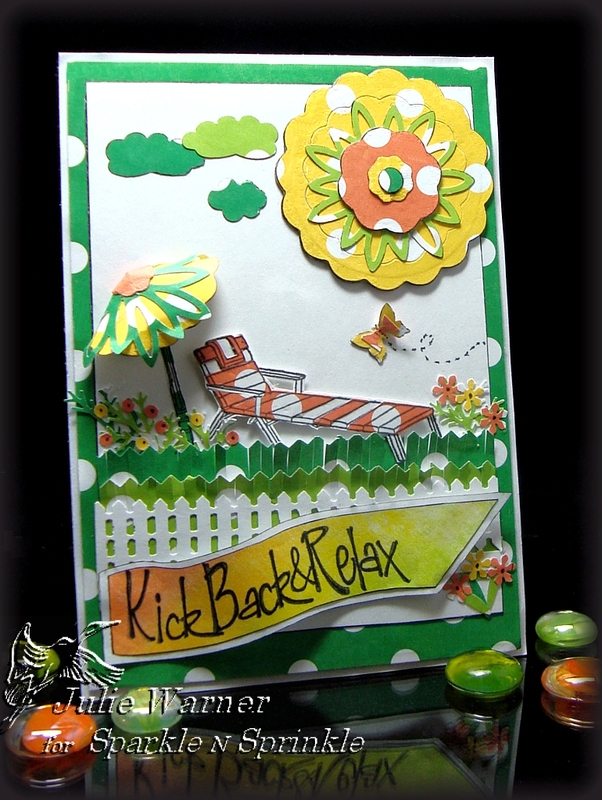 I stamped the ladybug stack twice, die cut one with a Mega Oval, sponged the background and drew a few grass sprigs. The second one, I colored the ladybugs with marker, cut them out and popped them up just a smidge on top of the base image. I used the same oval die to draw a slightly larger frame on black c/s and hand cut it. The greeting was also die cut w/ a long rectangle (it was resized) and sponged w/ lt blue ink while the die was still in place. I used an embossing folder on the green panel. After stamping and coloring the ladybug border, I cut the bottom with a Quickutz scallop border and sponged as before. I cut another scallop border out of black and offset it. The front of the 4.25 x 5.5 (A2) card was stamped w/ the ladybug background and colored as before. I made 3 black Faux Brads and attached them. This second card is for Cindy Haffner’s challenge DTGD10cindy_haffner. All images and embossing powders are Sparkle N Sprinkle. For this one, I stamped and embossed the seashore circle first w/ white on the teal and again w/ teal on the white. I die cut the center only of the teal and the entire circle of the white one. The smaller teal is popped up slightly on top and I cut a bigger teal circle to back the two. The white panel has the upper corner punched with a deep edge punch and the center lower section punched w/ a small border punch. I used a Cuttlebug border to emboss the flourish across the center. 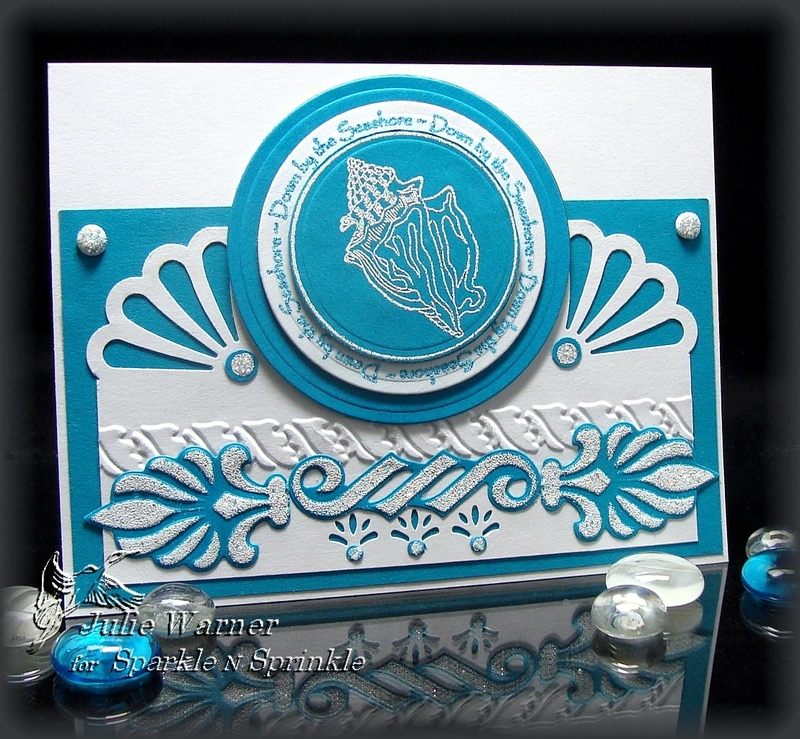 The teal elements were die cut using the Spellbinders Symbology set. I left the die in place, sponged on white ink and embossed w/ the vanilla ice ep. I cut the ends off the two fan like elements and attached them under the embossed strip. An 1/8 inch hole punch was used on the parts I cut off and I glued the 3 tiny circles under the lower punched border. I used a small pencil eraser to dot the white ink on a teal scrap and embossed it then placed these circles under the upper punched corners. I made 2 vanilla ice embossed faux brads and attached them to the upper corners of the teal panel. Thanks so much for stopping by! I hope you’ll drop by Splitcoast and check out all the fabulous challenges. You’ll need to be a Fan Club Member to view them. So if you’re not a FC Member, why not join? It’s less than most magazine subscriptions and way more fun. Welcome to the ODBD July Release Blog Hop! We have been having fun playing with these sets and I know you will too! If you arrived here from Sandee’s blog, then you’re in the right place. If not, you may want to jump over to the ODBD Blog and start from there. Since it’s the Independence Day holiday weekend here in the USA, we’re going to keep the hop real simple! There are no secret words to collect, no email to send to me… just a fun blog hop! Here’s the fun part! There are THREE prizes of WINNER’S CHOICE ONE FREE SET, but they are hidden on three different designer’s blogs! You won’t know who has the prizes! For my card, I’m using two of the new sets, Our Daily Bread and The Living Bread. This is one of those cards that hardly resembles the idea I started with this morning. I woke up with a clear picture of the card I wanted. Maybe I’ll get to that one another day since this definitely isn’t it, lol. The wheat cross was stamped with a combination of lt brown and palm leaf inks then the verse was stamped with evergreen pigment ink. It’s attached to a slightly larger green panel and both have the edges rounded. The punched tan layer has the edges sponged. Remember those hand held ribbon punches? I remembered I have one but it took me a while to find it. When I did, I used it on a leftover strip of the dp and inserted a narrow chocolate satin ribbon through the slits. Just for fun, I twisted the ribbon before attaching it. The final card measures 4.25 x 5.5 (A2). The Blog Hop will run from 8am Eastern on Thursday, July 1 through 8pm Eastern Friday July 2. At that time the three designers with the prizes will randomly select their winner from their commenters. They will check this post to be sure the person they draw has left their comment here, stating that they have completed the hop…. and then they will give me the name and the winners will be announced on Sat. the 3rd on the ODBD Blog! The next stop is Randi’s Blog. I know she’ll have something fabulous to share!